It’s not news that honey can be used for healing. Its use has been well documented since ancient times to address a myriad of symptoms and sicknesses. I’m sure you’ve seen it in your home remedy book as both a topical and ingested natural solution. Unfortunately, mankind and industry have deformed what traditional honey is through processing and even pasteurizing, but worse by watering it down with corn syrup and other non-honey fillers. Because of this, healers know that raw, unprocessed honey, has the most nutrition, and healing power. But did you also know that different honeys have different levels of healing power? Manuka honey is a very special honey that has gained popularity for its healing power over the last several years. Companies have popped up everywhere to sell their brands of the “miracle cure,” but not every product is the same and you should learn the difference so you don’t fall for the manuka honey scam. 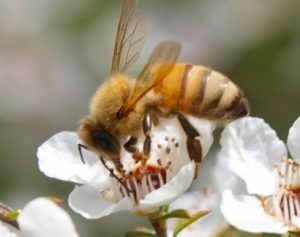 The bees that produce manuka honey get their pollen from the manuka bush, a tea tree plant that has long been known to have healing and nutritional properties. All honeys have different levels of antimicrobial properties, but manuka honey additionally is made up of non-hydrogen peroxide, which boosts that antimicrobial power to unbelievable levels. This is what specifically gives it its potent healing power. Different bees from different regions in New Zealand, will have different manuka plants as their source. Each plant gives off different levels of the antimicrobials found in the honey. 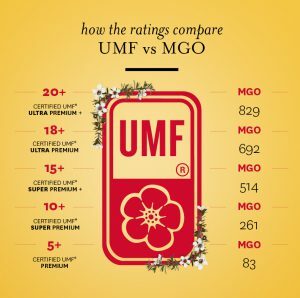 To regulate this and ensure honeys are being promoted with the proper levels, and not falsified, a certification was created with the trademark UMF (Unique Manuka Factor). The potency levels of manuka honey are marked with UMF, meaning they have been tested and certified by the Active Manuka Honey Association of New Zealand. The different UMF levels are measured between 0 to 30, with higher numbers having higher levels of antimicrobial power. These levels are considered to have no extraordinary nutritional value, and offer the health benefits equivalent of eating any raw honey. At UMF level 10, the nutritional value increases significantly and manuka honey becomes a true healing resource. This is the recommended level for most individuals who simply want to be healthier, have a stronger immune system, reduce allergies, and improve their digestive system. If you suffer from any minor chronic ailments, perhaps just a notch lower than perfectly healthy, you might benefit from an increase of UMF in your daily dose of manuka honey. Things like chronic minor infections, or even colds and coughs, can be relieved and prevented by taking a daily dose of level 15. Starting at UMF 20, the healing benefits again are strengthened, and will be beneficial for anyone who has any sort of severe, chronic health issue. People with autoimmune illnesses, severe bowel or digestive disorders, obesity and diabetes, have been known to find relief with daily level 20 doses. Please note that some can be sensitive to these UMF levels and have minor unpleasant reactions if doses are not started small. If you have any allergy to bees, using or ingesting large amounts of any honey is not recommended. Sometimes instead of a UMF certification, a bottle will show an MGO level. MGO stands for methylglyoxal, which is what is chemically measured to determine the potency of the non-hydrogen peroxide that boosts the antimicrobial properties, as opposed to measuring the properties themselves as UMF does. As long as the honey is 100% manuka honey, this is generally a safe option as well. You can compare the levels of MGO to UMF in the chart to the right. The FDA has officially approved certain higher levels of UMF manuka honey to be used topically to help heal wounds, such as cuts and burns, faster. Use it to dress a wound and it will both help to prevent infection and heal the wound itself faster. Some people are prone to infection in certain or several regions, especially in the eyes, ears and sinuses. Manuka honey helps to fight infection, and taking it regularly will help to prevent it altogether. Because of the high level of antimicrobials in manuka honey, it helps to kill bad bacteria in the mouth that might fester and turn into infection, leading to gingivitis. This honey has been known to both cure and prevent such issues, by adding it to a tea or water and using it to flush the mouth. People who use this honey daily have claimed improved sleep, partially attributed to the many other health benefits, boosted immunity and better digestion, that allow the body to make better use of the healing process during sleep, which will lead to waking up brighter and more refreshed. Manuka honey can help treat low stomach acid and acid reflux, gastritis, and bowel function by repairing and preventing damage to the colon. It will help you regulate your digestive system, and better absorb nutrients from the foods you eat. It’s also great for any sort of stomach ailment, from simple tummy aches to painful ulcers. Irritable Bowel Syndrome, and other similar issues in the stomach and colon, can be helped tremendously by regular use of this honey. Taking 2 tablespoons of manuka honey each day is recommended to help protect you from getting a cold or the flu. This is especially true in the fall and winter, during cold season. Anyone with any sort of autoimmune disorder can benefit in the same way. This honey helps to strengthen immunity and help build energy to fight back against any ailment. It’s also raw and organic, so it supports a paleo and autoimmune protocol diet. Honey has often been used for allergy relief, helping people with asthma and allergies like hay fever to breathe better. Manuka honey offers additional help in healing sinusitis, cough, and tonsillitis. Manuka honey skin benefits are getting rave reviews. Used as a daily facial cleanser and toner, this honey can naturally lower skin pH, to help with dry skin, or as an acne treatment, and for preventing or repairing eczema and hives. It has also been known to help resolve rosacea, and really any skin rash. It is also frequently used as a hair treatment to reduce hair loss, dry scalp or dandruff, and prevent frizz and split ends. Some people will make their own treatments, but many natural beauty companies are now carrying beauty products made with manuka honey. Although there is no evidence that manuka honey actually cures cancer, patients are finding it useful during treatment. It boosts the immune system, and can be extremely helpful for anyone needing to build up stamina to get through a successful chemo therapy. Many people are also using manuka honey to treat their diabetes or high cholesterol. The medical industry dose not believe it vital to test the science of this healing power, but believe the people that they are benefiting. If you suffer from any autoimmune or chronic condition, I definitely recommend trying to add this in to your daily intake. I have previously heard that some people use bee stings to help with nerve disorders, such as MS, and I wonder if this would also be helpful. You can find manuka honey at Whole Foods, are most local health food stores, however it’s not likely you will find real, quality manuka honey in a traditional grocery store. These days you can also order it online for much cheaper than you would likely find in-store, and it allows you to compare the numerous brands. I have narrowed down the selection process for you. The most important thing is that you are not getting a watered down, or fake version of manuka honey. 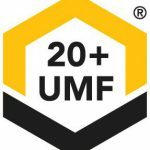 If you purchase one that shows the UMF trademark and certification it’s guaranteed to have the displayed level of potency, especially if you buy it from a reputable source such as Amazon, Whole Foods or Thrive Market. The recommended manuka honey options listed below are all organic, raw, certified UMF at varying levels, with good reviews and sales, and at good prices. How Could You Use Manuka Honey to Improve Your Health? I’d love to know how this amazing honey could benefit you. What ailments do you have from which you could get massive relief? If you’ve tried it, let me know in the comments below how it worked for you. I’m happy to also answer any questions you have about which product is best for you. I wish you happy healing. I lived in New Zealand for a number of years and was never without Manuka honey, mostly because then it was just a common item to have in your home. It was plentiful and not at all expensive. Living back in Australia and some years later, genuine Manuka honey is often in short supply and when you can buy it, rather pricey. I guess it just shows how easily value increases when there is a greater demand for a product. Even when I was first introduced to Manuka honey it was well known for it’s healing properties. Personally I have used it to help heal wounds, treat a Strep throat and reduce inflammation with great effect. A favorite of mine was to add it to herbal teas, especially Chamomile, a wonderful stress reliever and good for having a great night’s sleep too. Sadly there is a lot of ‘fake’ Manuka’ honey on the market as revealed in your post so it’s great that you have provided so much useful information here to help purchasers get the real thing. This was an amazing and informative article about Manuka honey. I am big into alternative medicine and natural cures for healing the body, but with manuka honey I did have questions. I wasn’t sure why they had the different ratings or why they called it “manuka honey”. You clarified that for me. Thanks so much for such an informative article and recommendations, so when I run out, I can stop by and review this. I wish you had a “Pin it” button, so I can add this on my Pinterest board to save it for later! Could you do that? Hi, Tiffany. Thanks so much for your feedback. I definitely need to get a pin-it button for all my posts. Great idea! Hi, Kristin. It’s definitely true when you have something that is only produced in a particular region in the world, it’s unfortunately a bit expensive to get elsewhere. But I’ve found some relatively decent prices. It definitely would be worth trying if it can offer the benefits many are getting from it. Thanks for visiting and offering your feedback!